Thousands of hydraulic couplings have been produced; almost all of them in the United Sates. This product consists of 4 main design classes. The duty ranges from 2 to 40000 HP and covers speeds from 600 to 4000 RPM. The designs include antifriction or journal bearings; internal or external, centrifugal or positive displacement pumps, steel or aluminum rotors and one piece or housings. Not unlike other brands; Gyrol® Fluid Drives offer infinitely variable speed control, no load starting, torque limits, controlled acceleration and deceleration, shock absorption and tensional vibration, transmits power at 95% efficiency and eliminates power waste on centrifugal machines. All of this is achieved through power transmitted smoothly by oil particles that are accelerated in the impeller (primary mover) and decelerated as they strike the runner connected to the load. There is no mechanical connection between input and output shafts. The speed is varied by a changing quantity of oil between impeller and runner via a movable scoop tube. Variable frequency motors designed to achieve these characteristics cannot match the low initial acquisition cost, unprecedented reliability (some Gyrol® Fluid Drives have been continuously operating since the 1950’s), and low maintenance cost of the Gyrol® Fluid Drives without costly electronics requiring frequent updates and a clean running environment. 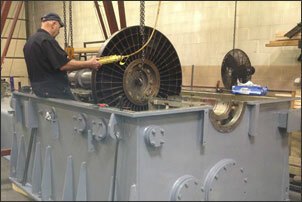 As a leading service and repair provider for the Gyrol® Fluid Drive product line, PowerFlow Engineering, Inc. stocks an extensive inventory of spare parts and complete couplings; maintains documentation on obsolete parts in order to reproduce them and most important; we have the specific engineering knowledge necessary to respond quickly and authoritatively to any planned or unplanned equipment outages. For more information about Gyrol® Fluid Drive repair and maintenance, call us at 1-800-446-0733 or contact us. Gyrol® is a registered trademark of Howden North America. Powerflow Engineering Inc. is not affiliated with, authorized by, or related to, Howden North America in any manner.